The Charles Daly single-barrel trap gun that suffered ejector carnage. Prussian-made Charles Daly boxlock guns used an ejector system that was based upon John Deeley’s Patent No. 4289 of 1886 and No. 6913 of 1888. In this design, for each barrel there is a tumbler, a mainspring, a swivel to connect them, a sear and a sear spring—all self-contained in their own housing. It is very much the mirror image of the lockwork in a typical boxlock minus the cocking levers. The tumblers are pushed into the cocked position by the ejector segments as the gun is closed. This is the very same ejector design used by Westley Richards to this day, and in that application it is very reliable. As used in the Prussian Daly guns, though, reliability is a bit less than stellar. This is not down to any inherent design fault of Mr. Deeley’s mechanism; rather it has to do with the method of tripping the ejector mechanism that was used in the Daly guns. Both the Westley Richards and Dalys depend upon the slight fore and aft movement of the mainspring, inherent in all A&D boxlocks, to trip the ejector when that barrel is fired. The only difference between the two is that in the Westley Richards, the ejector-trip lug is made integrally with the mainspring, while in the Daly the mainspring moves a separate trip piece forward when the hammer falls. The two problems that arise with this arrangement are tolerance stacking and wear, because the trip pieces are invariably relatively soft and easily deformed. Anyway, the reliability of this mechanism as used in Daly guns is not the subject of this article. 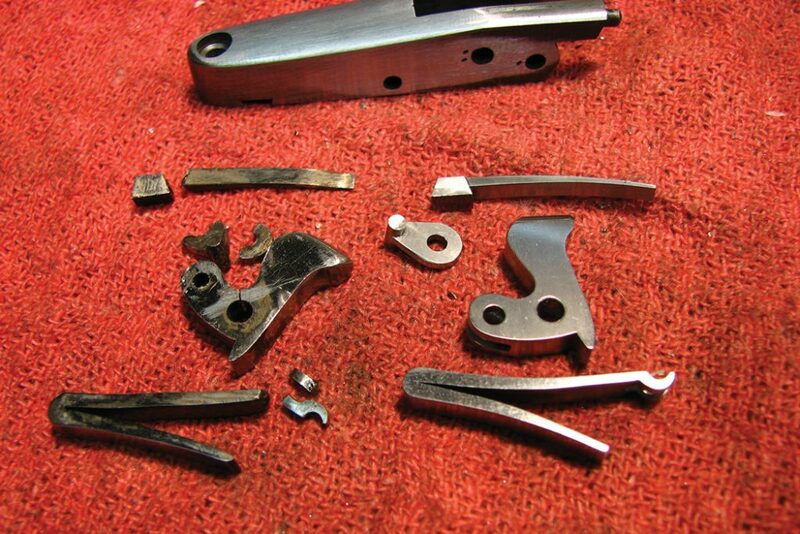 The broken parts of the ejector mechanism alongside their replacements. The subject of this article is a Charles Daly Sextuple-bolt, single-barrel trap gun that suffered the failure of every part of the ejector mechanism except the sear and the housing that contains everything. The ejector mainspring, its swivel, the ejector tumbler and the sear spring all were broken. The mainspring was broken into multiple pieces, with one of the fingers that engages the swivel embedded into the forend wood and protruding through to the checkering. I don’t know exactly what caused this mechanical carnage, but I suspect that trying to install the forend with the ejector in the tripped position combined with excess force played a part. In the past I’ve had to make every one of these parts in the course of repairing the ejector in a Daly, but never have I had to make them all for a single gun. It’s very important that the ejector mechanism not trip before the main lock is cocked. Disassembly of the mechanism was complicated by the broken pieces that had become wedged in place. Once that was accomplished and assessment made of what needed to be done, the actual making of the replacement parts proceeded in the usual fashion. A new tumbler was made from O1, an oil-hardening steel that also through-hardens and, when tempered, has excellent impact-resistant properties. Other than drilling the pivot-pin holes on the mill, the tumbler was entirely hand made. The swivel was also made from O1, with the pegs machined on the mill using a shop-made hollow cutter, to ensure that the pegs were actually round and perfectly concentric on each side. This is very important, because any eccentricity would load one peg more than the other and accelerate the failure of that part. The pegs being perfectly round and concentric, which can’t really be done by hand filing, also contribute to a much smoother-working mechanism. 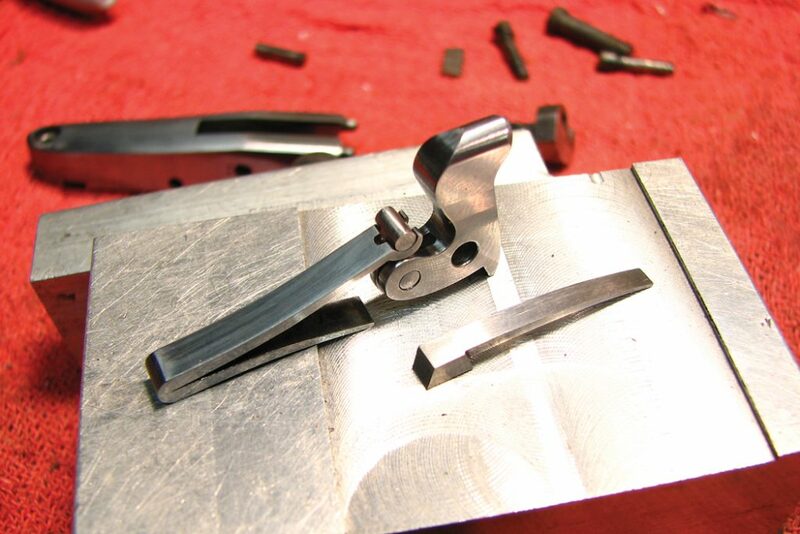 After the pegs were machined, the pivot-pin hole was drilled and the swivel was cut free from the stock, then shaped by hand. The swivel pivot pin was made from O1 on the lathe. With the tumbler and swivel assembly finished, next came the mainspring. This was made from 1095, a high-carbon plain steel that is the material I prefer for V-form and leaf springs. After heating and forging the material over onto itself, I machined it to within .010″ of its finished width and machined the pocket for the hook that engages the swivel—again to be certain of equal bearing of the hooks on the swivel pegs. After those operations, all shaping, fitting and polishing was done by hand. The repaired and reassembled mechanism. The final part to be made was the sear spring, which was a single leaf and was dovetailed into the ejector-mechanism housing. This also was made from 1095, with the dovetail end cut slightly oversize on the mill so that it could be properly fitted by hand to its slot in the housing. The leg of the spring was shaped by hand. With all of the preliminary fitting and polishing done, the parts were heat-treated as appropriate for their material. After heat-treating, all of the parts again were hand polished to a bright finish, the mechanism was assembled and the timing was set so that the ejector tripped only after the lock cocked and the action was open far enough for the empty to clear the standing breech. 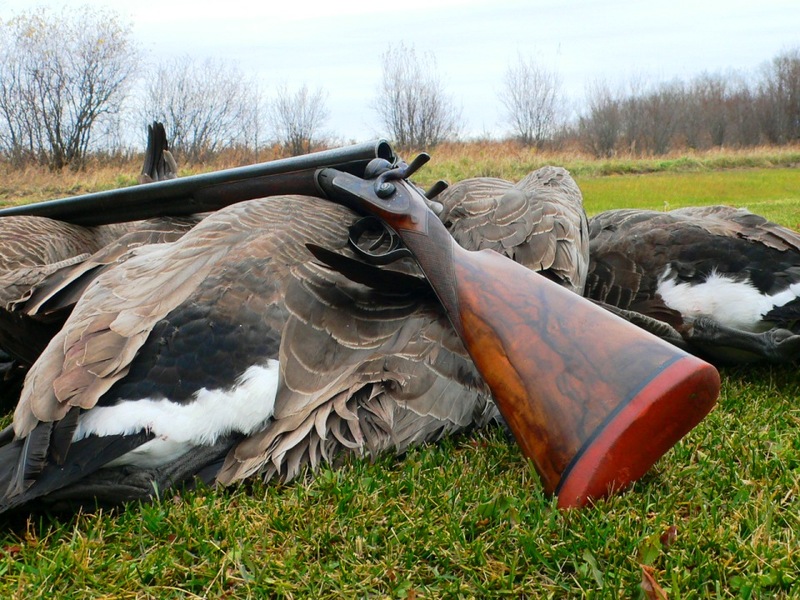 It’s very important that the ejector mechanism not trip before the main lock is cocked, because a shooter may not open the gun any farther once the empty shell ejects. In this scenario, if the hammer is not caught by the sear and the action is closed on a live shell, the gun likely would discharge. With the mechanical repairs complete, the hole in the checkered area of the forend was repaired by drilling a small (.093″) hole where the piece of mainspring had pierced the wood and inserting a small dowel of walnut. The inside surface was cut off flush with a chisel, and the outside of the repair became invisible when the checkering was recut in that spot. That about did it, and all I can say is that I’m glad it was a single-barrel gun! To see more of Dewey Vicknair’s work, visit vicknairgunsmithing.blogspot.com or www.vicknairrestorations.com. As the saying goes, there’s more than one way to skin a cat. 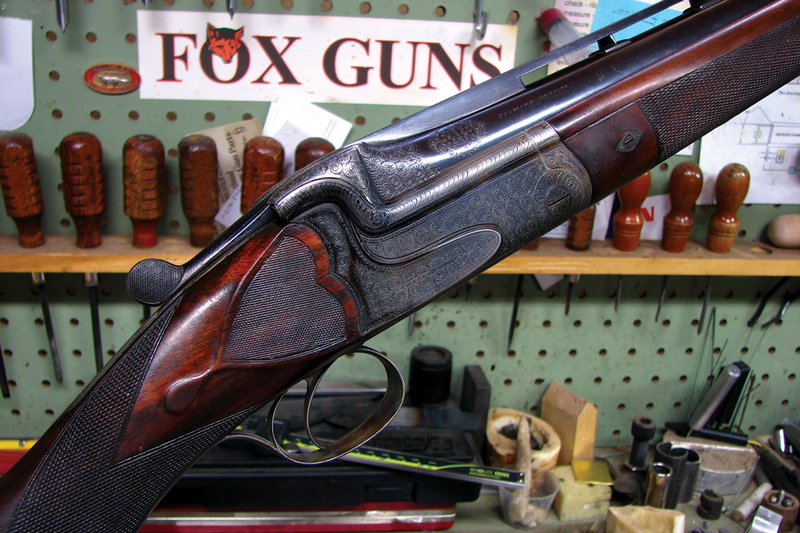 There’s also more than one way to make a leather-covered recoil pad.